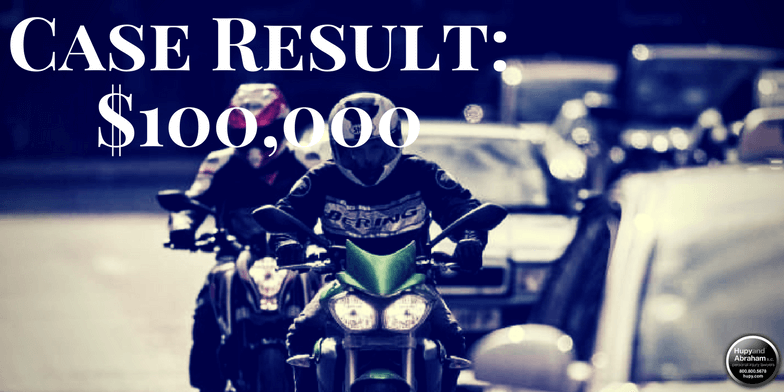 $100,000 for Non-Contact Motorcycle Accident Victim | Hupy and Abraham, S.C.
Our client was riding his motorcycle on a sunny summer afternoon in Humboldt, Illinois when an inattentive driver pulled out from a stop sign directly into his path. He had no way to avoid a collision other than to lay his bike down. Though he wasn’t hit by the vehicle, he sustained a shoulder injury and multiple lacerations to his head. Attorney Vito Manicioto persuaded the insurance company to accept liability and offer the $100,000 policy limits despite there being no contact between the vehicles. The case settled within 30 days of submitting the client’s medical specials.